Carbon, on the uptake | Watts Up With That? Atmospheric carbon dioxide (CO2) is one of the most important greenhouse gases and the increase of its abundance in the atmosphere by fossil fuel burning is the main cause of future global warming. In past times, during the transition between an ice age and a warm period, atmospheric CO2 concentrations changed by some 100 parts per million (ppm) – from an ice age value of 180 ppm to about 280 ppm during warm periods. Scientists can reconstruct these changes in the atmospheric carbon stock using direct measurements of atmospheric CO2 trapped in air bubbles in the depth of Antarctica’s ice sheets. However explaining the cause of these 100ppm changes in atmospheric CO2 concentrations between glacial and interglacial climate states – as well as estimating the carbon stored on land and in the ocean – is far more difficult. The researchers, led by Dr Philippe Ciais of the Laboratoire des Sciences du Climat et l’Environnement near Paris, ingeniously combined measurements of isotopes of atmospheric oxygen (18O) and carbon (13C) in marine sediments and ice cores with results from dynamic global vegetation models, the latter being driven by estimates of glacial climate using climate models. From these results, the authors conclude that the cycling of carbon in the terrestrial biosphere – that is, the time between uptake by photosynthesis and release by decomposition of dead plant material – must have been much smaller than in the current, warmer climate. Furthermore there must have been a much larger size of non-decomposable carbon on land during the Last Glacial Maximum (the period in the Earth’s history when ice sheets were at their maximum extension, between 26,500 and 19,000 years ago). The authors suggest that this inert carbon should have been buried in the permanently frozen soils and large amounts of peat of the northern tundra regions. I think that the study of gases ‘trapped’ in ice core samples is akin to reading tea leaves…you can see whatever you want to see. There were less plants and trees during periods of maximum glaciation. And apparently this comes as a surprise. Where do the universites find these geniuses? Unbelievable. When half of Earth was covered by glaciers, there were less green plants. Note to the researchers, the first section a) uses unphysical terms, b) is wrong c) is only an untested assumption, not supported by observations so far. What is interesting here is the apparent if perhaps only partial about turn by Philippe. What has extra piquancy is the absence from his co-authors’ list of Pep Canadell and Mike Raupach of us Australians’ rather dubious CSIRO, not to mention Corinne Le Quere, of guess where, UEA-CRU. Why are they missing in action? Although much of this is based on models… The difference seems to be that less carbon was captured by plants over time, but even less than that was released by soil bacteria. That imbalance, together with more capturing by the colder oceans would give the lower levels of CO2 during the ice ages, until a new equilibrium between release and uptake was reached. 180ppm CO2.. plant life would have been really struggling to ‘breathe’, and it was really cold too, lucky anything survived . give my nice warm temps and a nice 350ppm+ CO2 level any day !!! Ferdinand, What about the way CO2 levels dropped after Pinatubo & Cerro Hudson. Couldn’t the same ash fall on oceans have happened back then? What a statement of the bleedin’ obvious. Seven thousand years ago, Ireland had a prosperous Neolithic cattle-raising economy based on grassland (Ceide Fields, County Mayo). Similarly Caithness, Orkney and Shetland. Then the climate turned cooler and wetter, and moss took over, building up peat. Now, the climate has turned warmer and drier, the peat is drying out and rotting (on its own, as well as receiving help from peat-burning power stations and gardeners), permafrost full of preserved vegetation is melting and the vegetation rotting and the biosphere is generally getting into gear. 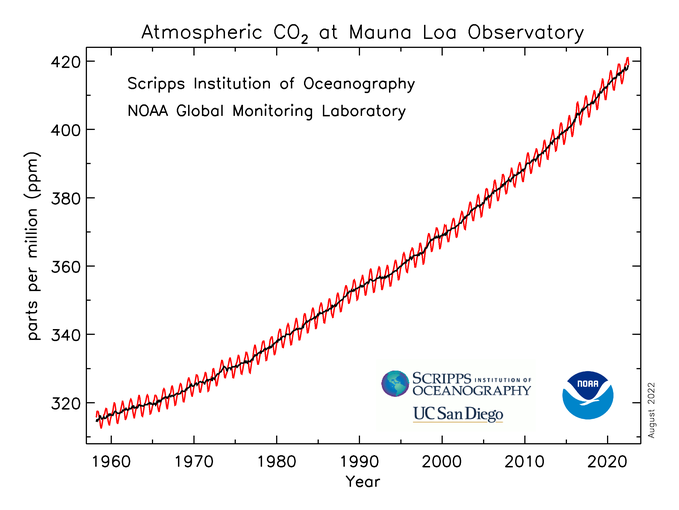 Quite obviously the levels of atmospheric CO2 are going up. What do you expect? Even the Warmisti haven’t yet been able to reverse time’s arrow and show that the rise in temperatures was caused by the rise in CO2 800 years later. If there was only a difference of some 100ppm (180ppm cf 280ppm) between glacial periods and pre-industrial conditions, and IF climate/temperature is driven by CO2, does that not mean that the sensitivity to CO2 must be higher than presently suggested by the alarmists? IF CO2 sensitivity is even greater than the alarmists suggest, how come has there been no or no statistical warming since 1995? Since you have an ingenuous combination of 18O from ice bubbles with 13C from ocean sediments mixed with results from dynamic vegetation models driven by glacial climate estimates from yet another climate model, who could possibly question this impressive results? So it goes on and on… until someone proves by detailed replication that Dr. Miskolczi’s findings are in fact incorrect and the infrared thickness of our atmosphere is not, to a meaningful degree, a constant, I’m staying put, that additional CO2 does not in fact warm this planet in the least, and this paper, as so many, is logically incorrect in it’s conclusions. For Ferenc Miskolczi’s papers have show this thickness has not budged a bit in the last sixty years with real data from real instruments and using real atmospheric science methods, nary a model involved. And yet he is the one scientist completely ignored. That to me is what is so amazing and something too deep for a child to understand, and should not be understood, for it is the purest deception that most adults cannot even fathom. According to estimates by the US Department of Energy, and others, burning fossil fuels provides 3% of the global atmospheric CO2 budget. I repeat 3%. Not an earth shattering, or warming, quantity. 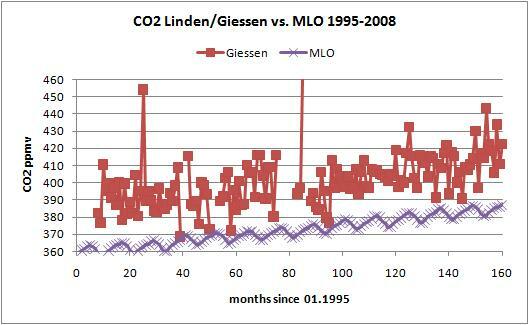 there is also much disagreement on atmospheric CO2 residence time between Dr. Lindzen, 5 years, to the IPCC, 200 years. One researcher said 20mins in some circumstances! Residence time is an important factor to get right even if CO2 does not affect climate. And it was all going so well until this point…. At least in future, the numpties wishing to get their degrees in climate “sciences” at UK universities will have to pay a bit more for their edgerkayshun. Oh, wait…..its better than we thought! How many different flavours can they apply to this crap? How many times can they repeat the “its worse/slower/faster/higher/lower/whatever” phrase without breaking into hysterical embarrassed laughter? How marvellously, wonderfully, cosy, fluffy bunnykins it must feel to be so certain. Of anything. Large areas of organic wetland (peat) soils are currently drained for agriculture, forestry and peat extraction. This process is taking place all over the world. This not only destroys the habitat of many species, but heavily fuels climate change. As a result of peat drainage, the organic carbon that was built up over thousands of years and is normally under water, is suddenly exposed to the air. It decomposes and turns into carbon dioxide (CO2), which is released into the atmosphere. Does this mean it is worse than we thought? Errr, what future global warming? Is this before or after the next Ice Age? Seems a very definitive statement if you ask me, “is the cause of future global warming”! Yet again they’re delving into the crystal ball gazing game. As others has pointed out too, how come it is a sensational discovery that there were less plants around in the Ice-Age than in an interglacial? Brilliant, not. I think the person is saying that we have to be careful to keep on pumping out C02 and stopping those green things from causing another ice age. It doesn’t take much to tip us into an ice age, and we better make sure we don’t get too much carbon sequestration from those nasty plants. Fortunately, when things get cold, the plants stop growing, and they stop carbon sequestration. Thus, the good C02 from volcanoes and such can pull the planet out of an ice age, since fortunately the plants are mostly dead. So CO2 has nothing to do with warming. Earth can’t warm with 180 ppm CO2. that’s what they tell us . So That means that anything above 180ppm has minimal impact. Why did Earth warm with low CO2 but cooled with high CO2 levels ? CO2 is important for vegetation and that’s it. Were there less plants and trees during periods of glaciation ? That means animals were bigger because there was less food.????????? Before you express such certainty from the ‘real data’ you have to identify what the error bars in that ‘real data’ are. Firstly, you have to show that sudden depressurization as the cores are brought to the surface does not alter the various gases in the bubbles found. Perhaps there are only bubbles from such deep ice under pressure after the ice is depressurized? Then you have to confirm that the carbon dioxide does not diffuse through the ice over the thousands and thousands of years (see “CO2 diffusion in polar ice: observations from naturally formed CO2 spikes in the Siple Dome (Antarctica) ice core”, Journal of Glaciology, Vol. 54, No. 187, 2008 ). None of this testing appears to have been carried out. Therefore, while the actual measurement of carbon dioxide in the air samples might be correct there is a leap of faith involved in stating that this was the atmospheric carbon dioxide concentration at the age of the layer of ice in which the bubble was found. Richard Verney ponders the implications for climate sensitivity as the authors assume most of the glacial cycle warming (and current ‘warming’) is due to CO2 or other greenhouse gases: in fact, the 100 ppmv CO2 changes of the glacial cycle (180-280) have much the same radiative forcing implications as the 100 ppmv of the past industrial period (280-380) – because the RF/concentration of CO2 curve flattens out and becomes almost linear at these values. The RF in both cases is computed to be about 2.5 watts/square metre. There are two forms of expression for climate sensitivity – one is the relation of Temperature to ppmv; the other is the expected change in T for a ‘doubling’ of the post-glacial pre-industrial level of 280ppmv (to 560) expected around 2050 at current rates of increase. The RF for the latter is calculated at 3.7 watts/square metre. I am in no position to evaluate the accuracy of the RF calculations – but at least nowadays they are performed by an internationally agreed computer code (HIGHTRANS) rather than the old USAF private enterprise model (MODTRANS) upon which IPCC relied for the the first models and generally was very shy about referencing. However, the RF is generated by the supposed downwelling infra-red and is calculated (for reasons I as a biologist cannot fully comprehend – any physicists out there please enlighten!) at a substantial height in the atmosphere. Those rays have a long way to go to get to the surface – encountering shifting clouds, water vapour and aerosols on the way. Thus, a factor is used – known as lambda, to get the T at surface from the RF at altitude. HERE is where all the uncertainty lies. 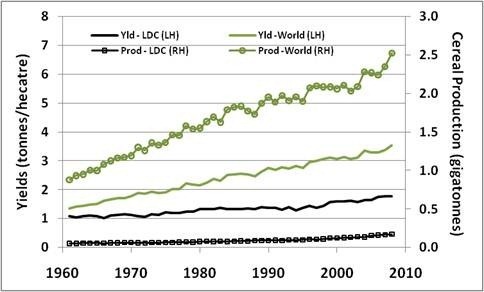 Values for lambda started out with IPCC 1990 report as 0.8. That was the consensus. Thus if you consider the shift out of an ice-age, of 100 ppmv and 2.5 watts, and lambda at 0.8, you derive a contribution from CO2 of 2 degrees (T = 0.8 x 2.5). Which is 40% of the observed shift globally of 5 Celsius. Accordingly, the carbon cycle response to warming and deglaciation was regarded as ‘amplifying’ the natural process (assumed due to changes in insolation driven by orbital and inclination shifts in the earth’s relation to the Sun – though many scientists are a bit sceptical there is enough power in that shift). However, doubts have arisen as to the the value of lambda. By 2007, IPCC experts (e.g. Kieth Shine) were suggesting it might be as low as 0.4 – thus halving the CO2 contribution to deglaciation to 1 Celsius or 20%. If this is right, then the climate sensitivity of ‘doubling’ at 3.7 watts, comes down to 1.48 Celsius, well under the 2 Celsius ‘alarm’ level. Thus – the investigation of the glacial changes merits further work – if the sensivity can be further refined. BTW: the other method of calculating sensitivity gave figures simply in terms of degrees Celsius per pppmv…..and the literature contains values that are quite absurd, often giving no reference to where the ppmv values lie on the concentration curve (for example, the curve rises steeply such that the first 50 ppmv accounts for most of the forcing and then tapers off due to the log relation above 150 ppmv and by 200ppmv becomes virtually linear). You can find values quoted from 2-14 ppmv per degree without reference to the base line – which would give 7-50 Celsius for the post-agricultural phase from 280-380, when we have seen only 1 Celsius. Such a simplistic approach to the deglaciation would give about 20 ppmv per degree Celsius – assuming all the shift was caused by CO2, which nobody would support. The current consensus in glacial studies still lies around the 40% mark – which for the linear part of the curve, would leave us with about 50ppmv per degree Celsius – and hence a future warming from ‘doubling’ of about 5 degrees Celsius. This needs revising within the bounds of current estimates to about 100ppmv per degree….in line with IPCC’s mid-estimate of future temperatures. But in my own view, sensitivity as measured in ppmv is not helpful. There ought to be a statistical test for assessing the reality of the amplification claimed in the deglacial process. As we know, CO2 does not instigate the change in T, and lags the peak of T by as much as 1000 years. My colleague, Jackson Davis, has attempted to correlate the rate of change of T with the rate of change of CO2 and additionally, whether the amplitude of CO2 is correlated with the rate of change. The correlation is very small, implying a very low climate sensitivity to CO2 and no significant amplication. We are still wrestling with very resistant reviewers to get this finding published. If our analysis has merit, then we are dealing with a very low sensitivity value – in particular, since the RF is presumably real, a very low ‘lambda’ factor. Only one researcher has suggested a low enough value…..Herman Harde at the Helmut Schmidt University at Hamburg has a poster in Geophysical Rsearch Abstracts 13 (2011), but his methodology is not yet clear. If Lambda is as low as 0.1, as he suggests, this would be in line with the lack of correlation between rate of T change and CO2 in the glacial record and would also mean that the industrial periods 100ppmv/2.5 watts would deliver a 0.25 Celsius ‘global warming’ component – which i think is about right (in line, for example with John Christy’s estimate of 75% natural component of the 1 degree rise observed, and my own estimate in ‘Chill: a reassessment of global warming theory, which was based on the satellite data and radiation budgets for the 1980-2005 period where the excess surface flux is about 4x the computed RF from CO2). This would mean that the doubling sensitivity (280 to 560) is about 0.4 Celsius. It also mean that the post 1950 warming – standing now at about 0.4 Celsius, and coincident with about 100ppmv and 2.5 watts producing 0.25 Celsius could be seen as 62% driven by CO2 (with an assumption that little of the warming remains to be seen from ocean uptake and release – which I think the data tends to show). Thus, the IPCC statement that ‘most’ of the recent warming is man-made, could be true – yet the overall expectation of greater future warming is false. However, equally true is that all the pre-1950 warming (also about 0.4 C) is natural – which their models actually do show! ).The next 180 ppmv will deliver slightly less as the curve flattens….at most another 0.5 Celsius. Of course, what this also means is that natural ‘variability’ (the current modelling community does not think in cycles), has the power to overide the weak CO2 effect – and that accounts for the current 15 year standstill. My own view is that the glacial cycles are not driven primarily by changes in insolation – rather by changes in wind patterns which are themselves related to cyclic solar magnetic/UV relationships. My reason being that ice-core data show changes which are too rapid to be explained by insolation or thesholds related to them. The Greenland ice-cores from 50kyr to 30 kyr BP show this beautifully, with clear Fibonacci series in the peaks of temperature – also a phenomenon not readily explained by Milankovich cycles. 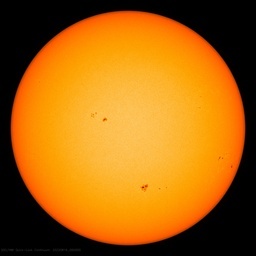 If the solar cycle now turns down – as it seems to be doing, and cycle 25 comes in very low, we should see the proof of all of this analysis and hypothesis….if the CO2 effect is as weak as many of us believe, it will get colder. The work has the value to document the big difference between the pre-industrial productivity and today productivity. If glacial was 50x, the pre-industrial was 100x and now we are at 150x, 50% more then pre-industrial values. Further analysis could show how much of it is attributable to the last 150 years warming and how much to more CO2, but it is very important to see the difference to pre-industrial level. It is vital to highlight this point in view of any discussions about reducing CO2 to pre-industrial levels. Conclusion: people who want to do it would like to exterminate 1/3 of current living beings on Earth. And the follow-up question : how much extra living beings can the planet host with some more CO2? 500ppm? Can we get to 200% pre-industrial values? Ice core measurements a “direct” measure of past CO2 concentrations? I’d hate to see a convoluted measure then! Yes, that leapt off the page at me too. According to the authors biologic activity was 40 petagrams carbon during glacial period, 80 petagrams during pre-industrial, and 120 petagrams today. So the primary producers in the food chain are 50% more productive today than 200 years ago. This is the highest figure I’ve seen. Typically 15% to 30% is bandied about for the agricultural windfall of increased atmospheric CO2 but that doesn’t take into account longer growing seasons from CO2 induced surface warming nor reduced water requirements. So this is a VERY interesting admission coming from the nattering nabobs of anthropogenic negativity. I must agree with your conclusion that these people don’t give a fig about global warming all they care about is reducing the human population. That can’t be done so long as primary production in the food chain keeps rising – useless eaters can’t increase in number without an increase in food supply. As long as we keep pumping CO2 into the atmosphere the biosphere just gets more and more active, winters get more and more mild until the Antarctic continent is covered by temperate forest again, and the biologic carbon cycle is several times greater than it is today. I call these people ice-huggers. They’re lunatics. The last thing they want is a green planet. They want a planet that is cold and unfriendly to life including human life. I don’t know what is most embarrassing: The university of Bristol using past low against “present perfect pre industrialized day” average or that they excluded past eras with higher average than 280. Around 93% of the accumulation of CO2 in the atmosphere is natural and most of that is from inorganic sources (the equatorial oceans). Click on my name for details. Ferdinand Engelbeen has a very good point, that he made above. We also have to conclude then that the size of the plant biosphere, creates its own balance of CO2 in the atmosphere. When the mass of the vegetation biosphere increases (like it did in the Cretaceous for example), this increases the CO2 balance in the atmosphere. Changes in the distribution/type of plants can also therefore affect the balance of CO2. The evolution of grasses 24 million years ago seems to have reset the natural CO2 balance in the atmosphere at a lower level (from 1200 ppm to 270 ppm) (which is where it has been for the past 24 million years, a little known fact in the climate science community). Sorry, I disagree. Some skeptics don’t like the ice core CO2 data (or even the current atmospheric CO2 data), because they are one of the cornerstones of the AGW scare. But that are real data. That are real data that don’t say what they are claimed to say. 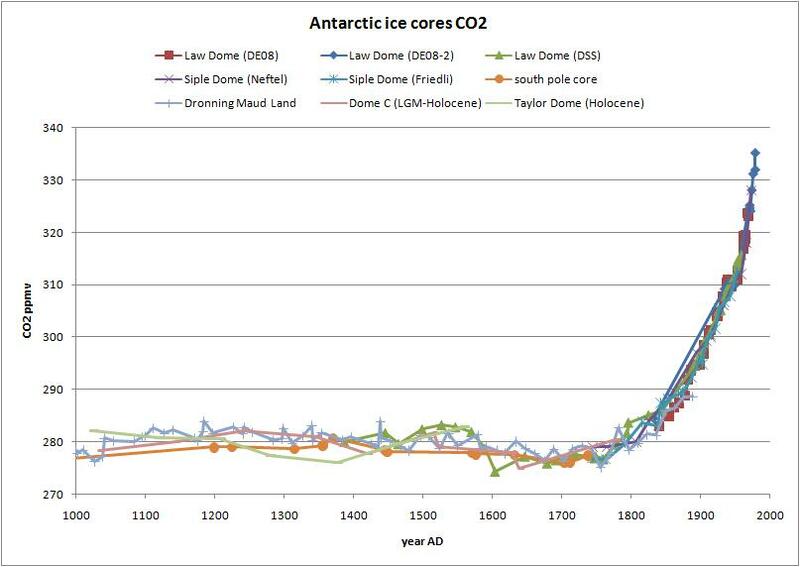 The alleged pre-industrial CO2 cap of 280 ppm is a convenient ‘err’ in the assessment of ice core data. The temporal resolution of those data is not sufficient to support such claims. What I would like to see, is whatever they use to “baseline” or “proof” the ice core information. Any links would be helpful, because I’ve certainly looked, and can’t find it. According to the unproven theory of AGW. Here is why CO2 neither cools nor heats over short or long periods of time. The oceanic and atmospheric teleconnection used to produce weather pattern variation oscillations has far greater sustaining energy needed for such oscillations than puny CO2 has. If there is any warming or cooling that can be attributed to CO2, it will quickly be overrun, outrun, wiped out, and beaten to the mat by an “ill wind this way blows”. So, in my opinion, the mortal wound in the paper is this: The authors fail to present the background weather pattern systems in place at the knee bends of rising/falling CO2. They must first rule out the first encountered pathology (intrinsic active weather pattern variation oscillations) before making their case regarding CO2. None of these scientists ever do this in their gloom and doom papers. They walk into a sh**-filled room and look for mice turd, whilst ignoring the sheepish elephant standing in the corner. “At night it is colder than outside”. The LSCE was founded in 2006. Seems they’ve achieved a lot of experience within 5 years to come up with such a crap to justify their raison d’être… and to cry for more $$$ funds. So….global vegetation based on a computer model based on input about climate from another computer model…. The “ingenious” part would be figuring out how to get that past peer review. Oh wait, we have pal review now. OK, so what was the ingenious part then? Carbon cycle? What of the carbon sinks? I have yet to see any mention of the ongoing process of the calcium carbonate deposits on igneous rock, that have to be a current process. We have a lot of basalt in western Colorado. The exposed boulders, as well as buried rocks get covered from the top down in calcium carbonate. How many tons does this comprise? Gail Combs says: November 21, 2011 at 4:57 am Excellent point about atmospheric pressure due to altitude. GIGO squared. I love it. A whole new level of abuse in computer modeling. Because 300 PPM is the atmospheric CO content, this amount is chosen as the 100% growth point. Been awhile since it was only 300ppm, that value isn’t even on the “official” Mauna Loa graph, now we’re almost at 400ppm. Is that a very old reference, an “unmixed” local reading, or just mistaken? Atmospheric carbon dioxide (CO2) is one of the most important greenhouse gases and the increase of its abundance in the atmosphere by fossil fuel burning is the main cause of future global warming. Has someone invented a time machine? Models, models, models and proxy data feeding into more models that feed into ignorance and ideology. And what came first the swamp or the permafrost. As a northerner I am inpatient with southerners trying to tell us how things are and were in the arctic. I think it’s the pro-AGW “concensus” people that have a problem with the ice-core data. They’re in denial that warming proceeds increases by CO2 levels by an average of 800 years. The two hardly go hand-in-hand. The data shows first it warms and then CO2 goes up. Which means from the AGW supporters standpoint, it undermines one of their bases arguments. There is of course, not a single supporting fact for that statement. It’s accepted as fact. so they established a fire-rationing committee. that they pulled 100ppm out of the atmosphere. “Oops! All those glaciers marching south? Trees don’t grow any more either. Now we know why the Neandertals died out. So the primary producers in the food chain are 50% more productive today than 200 years ago. This is the highest figure I’ve seen. Typically 15% to 30% is bandied about for the agricultural windfall of increased atmospheric CO2 but that doesn’t take into account longer growing seasons from CO2 induced surface warming nor reduced water requirements. So this is a VERY interesting admission coming from the nattering nabobs of anthropogenic negativity….. It is nice when information from completely different areas dovetail. How convenient to ignore it in scientific papers, of all places, with nary a mention. Gail, you are right, these are not scientists, they are puppets. According to estimates by the US Department of Energy, and others, burning fossil fuels provides 3% of the global atmospheric CO2 budget. I repeat 3%. Not an earth shattering, or warming, quantity. there is also much disagreement on atmospheric CO2 residence time between Dr. Lindzen, 5 years, to the IPCC, 200 years. Firstly, you have to show that sudden depressurization as the cores are brought to the surface does not alter the various gases in the bubbles found. Perhaps there are only bubbles from such deep ice under pressure after the ice is depressurized? After drilling, the ice may relax under cold conditions (-20°C) for a year and more. Normally long enough to expand all ice (+50% in volume) and decompose all formed clathrates and reforming the bubbles. Any remaining clathrates decompose at measuring time, as that is done under vacuum. 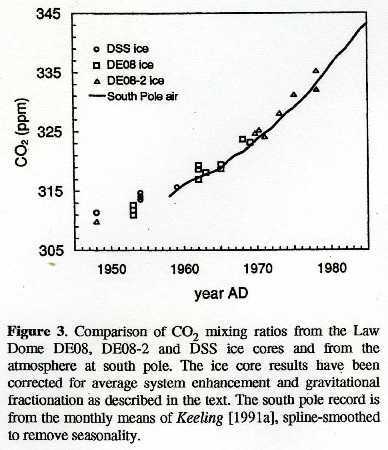 The reference you did provide shows that there may be a (theoretical) diffusion of CO2 through the ice, which results in a broadening of the averaging from 20 to 22 years at medium depth and up to 40 years at full depth (70 kyr old). Thus the resolution gets worse, but that doesn’t alter the average over that period, only increases the smoothing of peaks to both sides. That is the case for the relative “warm” Siple Dome ice core (-22°C). For the much colder (-40°C) 420 kyr Vostok and the 800 kyr Dome C ice cores, there is obviously not such a problem: if there was even the slightest migration, the ratio of CO2 vs. temperature (dD or d18O) proxy would fade over time. For every interglacial/glacial period, the ratio between CO2 and temperature is about 8 ppmv/°C. This remains the same for each period 100,000 years back in time. If there was migration, the high (280-300 ppmv) levels over 10% of the time would spread over the 90% period where the levels were low (around 180 ppmv). there is a leap of faith involved in stating that this was the atmospheric carbon dioxide concentration at the age of the layer of ice in which the bubble was found. There concentration found is the average over the resolution, which is several years: from 8 years (over the last 150 years) for two Law Dome cores to 560 years (over the last 800 kyrs) for the Dome C core. The resolution depends of the local snow accumulation, which governs the speed at which the bubbles reach closing depth. And as there still are exchanges possible between the atmosphere and open pores in the firn, the average gas age is (much) younger than the ice where the gas is enclosed. That again is governed by the accumulation rate: for Law Dome the ice age – gas age difference is 30 years, for Vostok several thousands of years. stationed on islands in the Pacific during WWII. So yes all of this information was very well known for almost a century! I think we had this discussion before: plants grow on land (plants at sea have plenty of CO2 for their synthesis, no problem there). But the average near-ground CO2 level is 40-50 ppmv higher than in the rest of the atmosphere. Much higher at night (soil bacteria at work and plant respiration) and in the first hours of the day. So at least during a few hours in early sunlight, plants can grow even when the “background” CO2 levels were 180 ppmv. http://www.agu.org/pubs/crossref/1996/95JD03410.shtml. Etheridge also measured CO2 in firn, top-down until bubble closing depth. Over the 72 m depth, there was a gradual change in CO2 level, where at closing depth the level was about the same as 7 years before at the South Pole. Thus at closing depth, the average gas age was 7 years older than at the surface. There was no difference in CO2 levels measured at closing depth between still open pores in the firn and already closed bubbles in the ice. Thus the composition didn’t change for CO2 in the bubbles (it does for smaller molecules like O2 and Ar). In how many places are samples taken for the various proxies to determine global CO2 levels pre-industry times? There’s ice cores from Greenland and Antarctica and, if I recall correctly, a couple of glaciers, and then there’s a handful of sediment sites. From the plotted data I’ve seen the data points were all over the place, not one neat dot at 280. If the CAGW major rubber duck CO2 weapon were a skeptical tool of reason instead, from how many sites would the skeptics need the various proxies have been needed to be taken from to cover the globe with an average of 280 to the point of satisfying the raging CAGW alarmist that it was a more or less accurate number? This opinion of the late Prof. Jaworowski was based on his experiences which ended before 1992, when he wrote that. In 1996, Etheridge e.a. published their findings of the drilling of 3 cores at Law Dome, which answered a lot of allegations made by Jaworowski. With what mechanism can CO2 levels enclosed in air bubbles of the ice be reduced to 180-300 ppmv, while the air surrounding the core is at 360 ppmv (drilling period) to 395 ppmv nowadays? They’re in denial that warming proceeds increases by CO2 levels by an average of 800 years. The two hardly go hand-in-hand. 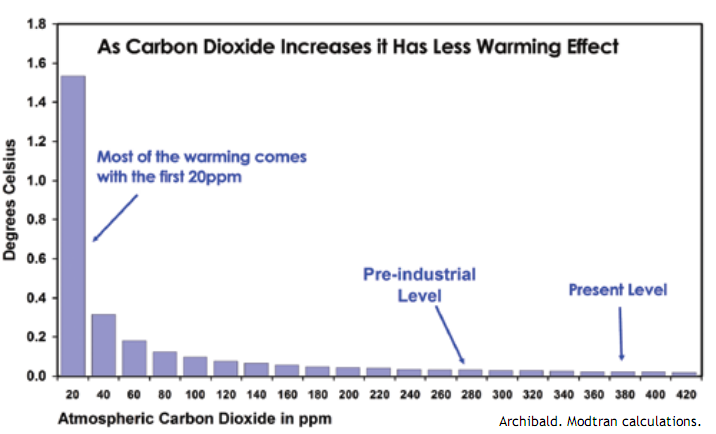 The data shows first it warms and then CO2 goes up. From the plotted data I’ve seen the data points were all over the place, not one neat dot at 280. The resolution of 2 out of 3 Law Dome ice cores is less than 10 years, the third is at some 30 years years. Law Dome only goes back ~1,000 yrs, which is absolutely uninteresting when discussing the peaks of a cycle with period ~120,000 years. The resolution of the ice cores used to claim that 280-300 has never been exceeded (400K-800k YBP to pre-industrial) have resolutions of several hundred to several thousand years near the CO2 peaks. We are at one of those peaks now. What is the current CO2 concentration, averaged over several hundred to several thousand years? The only way for non-detection of huge changes is if there is a high frequency of the changes. But that assumes that the low-levels of 180 ppmv sustained over 90,000 years would show much higher and much lower levels over short time (decades to centuries), with land plants already at the edge of extinction at 180 ppmv. Now that I’ve read it, it appears that CO2 measurements from glaciers and ice cores is highly uncertain and questionable. If you wouldn’t mind, what are your thoughts on that paper and its conclusions? It still is interesting, as we may say that any one-year peak of 20 ppmv or an increase of 2 ppmv sustained over 20 years would be measurable in the short, high resolution Law Dome ice cores (accuracy of the measurements at 1.2 ppmv – 1 sigma). Which is applicable only to the short, high resolution Law Dome ice cores. Assuming that the accuracy of short, high resolution ice cores persists with long, low resolution ice cores is, well, an assumption. BTW – 1 sigma? That is a wide net with large holes. My copy of Taylor Dome CO2 for 18-63K YBP has maximum resolution of 150 yrs. That is for only 2 of 72 intervals. The range of resolution extends to a low of more than 4,000 years, and averages more than 600 years. Near CO2 peaks, it can be more than 1,000 years. And TD is just for the last two interglacials, which is ~1 CO2 cycle length. The claim is made for up to 800k years – which is itself barely representative at ~6.5 cycles. “ … for non-detection of huge changes is if there is a high frequency of the changes. But that assumes that the low-levels of 180 ppmv sustained over 90,000 years would show much higher and much lower levels over short time (decades to centuries), with land plants already at the edge of extinction at 180 ppmv. Everyone seems to be focused on CO2 as a driver of temperature. Of all greenhouse gases, it represents, only, 3.5%. I would think water vapor ( 95% of all greenhouse gases ) would be of greater importance and interest; yet it’s hardly ever considered. If there are no huge variations in the past 150 years (with 8 years resolution), neither in the past 1000 years (with 30 years resolution), neither in the past 10,000 years (with 150 years resolution), then it is a huge leap of faith that the variability over previous interglacials were much higher. What is sure is that the current increase of CO2 in all known proxies (stomata data, sediments, coralline sponges) and ice cores is unprecedented in the previous 10,000 years over the full Holocene. Moreover, there is a quite good correlation (with a lag) between temperature proxies and CO2 levels over all periods, within all resolutions, except for the past 160 years, where CO2 starts to lead temperature, be it that still a temperature influence of about 4 ppmv/C is detectable around the CO2 trend. Thus any huge variation in CO2 levels in the far past should be preceded with huge variations in temperature (which has a much better resolution than CO2), but that is not the case. BTW, you need to make a distinction between the sample distribition and the resolution. While the resolution still may be similar (depending of the accumulation speed) even for the deepest parts of the ice core, the size of the sample needed, together with the resolution is what gives the time period which is measured. With the same sample size, the resolution broadens with depth as the number of layers per length increases. With smaller samples, as is the case for the Dome C ice core, even the deepest samples at 800 kyr have a resolution of 500-600 years. Also, the 2007 paper by Beck reported on thousands of chemical measurements of atmospheric CO2 concentrations during the 19th and 20th centuries, that showed that concentrations were sometimes greater than those measured today. My own conclusion is that I would place greater reliance on the chemical and stomata data than the ice core data. Could you please post a link to Etheridge? Because the many points raised by Jarowowski and Segalstad appear to be damning. If there are other convincing non-ice core proxies that confirm the ice core CO2 measurementts, I’ll be persuaded that the ice core measurements are accurate. Jarowowski et. al make many arguments that seem to be very hard to refute. I used to accept ice core evidence regarding CO2 levels as being very strong. Now I’m not so sure. But if you have contrary evidence I’ll consider it with an open mind. Yes we have had the discussion before. So if I follow your logic the CO2 in the atmosphere is 40-50 ppmv LOWER than the readings at Mauna Loa or in the Antarctic because the last time I checked volcanoes and glaciers didn’t fly. Also the wheat field maintained a 305 ppm +/- 5ppm level of CO2 during the day and only at night did it return to the higher levels of (estimating here) 315 ppm to 505 ppm from “soil activity” Anyone who has run a compost pile will understand the difference would be because of day to day differences in moisture levels and heat. The two things a dry cool glaciation would have in short supply. Therefore your 40-50 ppm higher at dawn would only apply to warm moist days although it certainly could shoot up to as much as 200 ppm more on some days in the summer after a rain. The plants are not sucking the CO2 levels down to 180 ppm, they are sucking the CO2 down to between 200 and 250 ppm (C3 vs C4?) So the plants put a big question mark in a 180 ppm level of CO2 during the glaciation especially since they are quite happy to reduce the CO2 by 50 ppm in a few minutes at higher levels. So if the plants are not removing the last 20 ppm of CO2 what is ??? The cold water in the oceans? To me the real killer is what we know of man and the mega-fauna. A few facts to start with..
1. In the South Eastern USA (was covered with trees and without mowing reverts to forest) the rule of thumb is about 500 lbs of animal per acre or two acres per cow. As you move west this reduces to square miles per cow. All these bits and pieces of information seem to indicate a much higher level of CO2 during glaciation or the plants needed to feed the herds of megafauna would not have survived the grazing pressure, shallower root formation, less seed head formation combined with the cold and dry conditions. For those interested “carrying capacity” “GRAZING CAPACITY” and “stocking rate” are the key terms to search for. http://www.agu.org/pubs/crossref/1996/95JD03410.shtml unfortunately behind a paywall, even if the publication is already from 1996. Etheridge e.a. drilled with three different methods, wet and dry (which didn’t give any difference), they measured the CO2 in firn top down, which shows that the CO2 levels at closing depth were average 10 ppmv less than in the atmosphere and thus about 7 years older, while the ice layers are already 40 years old. CO2 levels in firn and already closed bubbles in the ice were the same, no measurable fractionation. There is an overlap of some 20 years between the ice core measurements and the direct measurements at the South Pole. If you look at the objections against ice cores of Jaworowski and Segalstad, all objections are about ice cores from (long) before 1992 and most references are from… Jaworowski. Not the slightest new allegations or references after 1992. And two main impossibilities: there is no physical possibility for CO2 to migrate from lower levels to higher levels (and where cracks/drilling fluid are found, higher levels occur). And he didn’t accept that there is a difference between the age of the ice layer and the average age of the enclosed air. The latter is incredible for an ice core specialist, especially as Etheridge already in 1996 had measured the difference in-situ for the Law Dome ice cores. We are told that the CO2 in the atmosphere is “well mixed” so a reading at Mauna Loa or in the Antarctic represent the CO2 of the entire world. Except that the open air is not the same as a closed canopy. 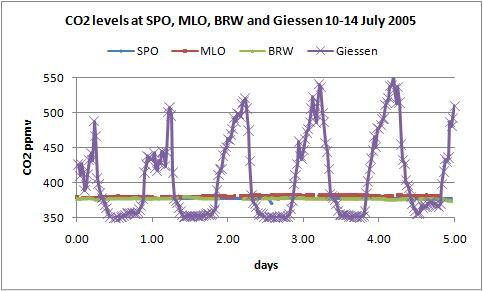 Especially as sunshine heats up the ground/plants and stirrs up the exchanges with the surrounding/above atmosphere… Or a little wind will do a lot of good… See the above CO2 graph from Giessen. Stomata data have the same problem as many of the historical data: taken over land where huge differences can be found between day and night, wind direction, sun or rain,… even within 15 minutes. 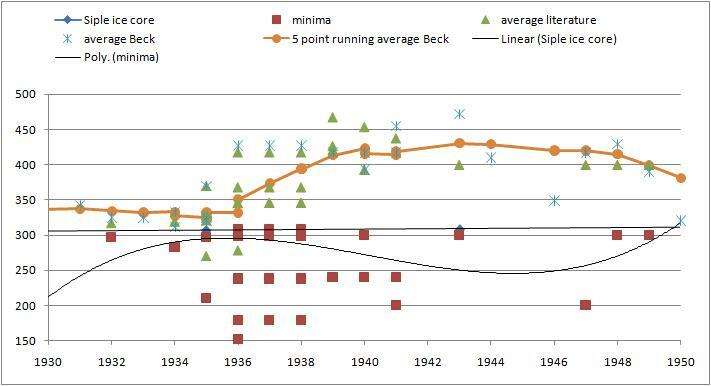 As in previous post, the Giessen data, the cornerstone of Beck’s 1942 “peak” has an enormous variability. The historical data were taken three times a day (7 AM, 2 and 9 PM) where 2 were at the moment of the fastest transition in CO2 levels… The historical samples show a one-sigma variability of 68 ppmv. Completely worthless to know anything about the CO2 levels in the bulk of the atmosphere. CO2 data from seaships and coastal with wind from the seaside show levels around the ice core measurements. Unfortunately, there are no seaside measurements in the period 1935-1950. Further, the stomata data don’t show any specific change in CO2 level around 1942. If there was a real peak of 80 ppmv up and down, the stomata data would go off-scale. Thank you for your response. This is common to many who question Beck’s conclusions. However, I would advise anybody here who is confused to read Beck’s paper very carefully, and draw your own conclusions. Beck states that he carefully selected historical measurements in order that background CO2 concentrations could be monitored, away from any anthropogenic influences, including over the oceans. Nobel laureates were involved with this work and I do not think that it can be dismissed. As I stated before, my personal opinion is that I would place greater reliance on chemical and stomata data rather than ice core data, given the uncertainties involved with all of the methods. Roger, I had a few years personal discussions with the late Ernst Beck. The main problem is that he used all available data, the good, the bad and the ugly, lumped them all together and averaged them. I downloaded all his data and descriptions of the methods for the period 1935-1950, where the 1942 “peak” of 80 ppmv is situated. There were lots of problems with data and especially the places where was measured, like Giessen in the other message. Sometimes the place was OK, but the apparatus was far too inaccurate. He included e.g. data from Barrow (a perfect place) taken with an apparatus, the micro-Schollander method, accurate to +/- 150 ppmv. No problem for measuring exhaled air, which was its purpose, but worthless for background CO2 measurements at around 300 ppmv. – or burning of 1/3rd of all land vegetation on earth and regrowth each in 7 years. – or an increase of 5°C in average sea surface temperature and back (purely based on Henry’s Law, not taking into account that vegetation acts in opposite way). – or a strong acidification of the ocean surface (with what?) and an equal alkalisation thereafter. – or the outburst of thousands of volcanoes all together, but there is no equivalent removal in such a short period. When are you going to acknowledge that your statement I’ve bolded above is a science lie? The atmosphere would be around 52°C HOTTER if it wasn’t for these ‘so-called’ greenhouse gases; water vapour accounts for 52°C cooling through the Water Cycle. Greenhouse gases COOL the Earth. The Earth would be 67°C not the 15°C it is in an atmosphere of N2&O2 without the water cycle. Real sceptics don’t accept the science because the science is junk. Greenhouse gases cool the atmosphere. This basic premise of the AGWScienceFiction energy budget is junk science, totally made up. I don’t understand why this hasn’t been picked up by the ‘heavyweights’ arguing against AGW – just as I can’t understand why both pro and antis accept without question the other base premise of the AGWSF energy budget – that visible light heats land and oceans.. This is fantasy physics. They’ve excluded Thermal Infrared, the real heat direct from the Sun warming land and oceans and us, just as they have excluded the whole of the Water Cycle. There is no verifiable, testable evidence that ocean pH has measurably changed due to higher CO2 levels, and I would need to see credible evidence that a rise in CO2 55 million years ago [and not something else] “caused large extinction in bottom-dwelling ocean creatures, and dissolved a lot of shells as the ocean became acidic”. The person quoted appears to not understand buffering. Also, the Jarowoski et. al paper spent considerable analysis on the capillaries of liquid water interlaced deep under the ice. If this is factual, then there is a way for CO2 to migrate through the ice since CO2 is very soluble in cold water. But maybe I misunderstood your reasoning. Next, you previously convinced me [with much patience, which I appreciate] that human emissions of CO2 are the primary reason for current atmospheric levels. However, I believe that Dr Beck’s research cannot be entirely discarded. The scientists who took CO2 readings were careful to stay on the windward sides of ships crossing all of the world’s major oceans, and took measurements on desolate windswept seacoasts and on mountain peaks. They were not government scientists looking for grants, but were actually trying to take accurate measurements. And they knew their work would be critiqued by their peers; errors and mistakes would tarnish their reputations at a time when reputations were everything to a scientist. I agree that some urban measurements are very suspect. But how do you explain the thousands of high CO2 measurements taken on the windward side of ships sailing across the South Pacific, the Sea of Okhotsk, the Atlantic, the Pacific, the Arctic, etc? Finally, the discussion always seems to gravitate to the rise in CO2, and stop there. But we should not forget that there were endless predictions of climate disruption, runaway global warming, rapid sea level rise, and other crises that would be caused by a rise in CO2. We should keep in mind that none of those dire predictions occurred. In fact, there is no scientifically credible evidence showing any global harm due to the rise in CO2, and there is much evidence that the increase has been beneficial to the biosphere. Therefore, there is something wrong with the AGW conjecture. At the very least, it has been wildly overstated. Given the long duration of time since these bubbles or voids were formed, I am skeptical that they still retain their original gas concentration levels unconatminated by absorbtion or out-gassing from their surrounding matrix. I presume that Henry’s Law applies to solids as well as liquids. In theory, for pure ice, there is a small layer of unordered, waterlike watermolecules at the ice surface-air boundary. That layer goes from a few micrometer at near melting to 5 atoms thick at -30°C and zero below -32°C. Thus still present at -20°C to -24°C for the coastal ice cores. As the measurements standard are done by crushing the ice at clod temperatures under vacuum over a cold trap (-70 to -80°C) that effectively removes all eventual dissolved CO2 from that layer. And the cold trap removes any water vapour that is coming along. That forms a closed layer where only some CO2 can adhere to the surface, but that is compensated for by using calibration mixtures before and after the tests. The structure at the border between ice crystals is semi-ordered, by the influence of both crystals and is far less waterlike than at the surface. Thus less possibility for CO2 to enter and diffuse through the mass. If you have two cold spheres of ice, the waterlike surface will recrystallize when you touch the two together and only with a lot of force you can brake the bound. Nevertheless. If there were sufficient channels with liquid water, there is a possibility that CO2 can migrate over time. The result of migration is that the highs and lows are flattening. Thus the resolution goes down and the higher frequency variations aren’t visible. That would mean that difference in CO2 levels between warm and cold periods would disappear. For ice ages / interglacials the difference in period of time is about 90/10, thus a complete migration would show a uniform level of about 190 ppmv i.s.o. 180-280 ppmv. But even the slightest migration should show that the highest levels farther back in time would decrease for each interglacial/glacial period. That is not the case. So we can say that for the coldest (-40°C) Vostok and Dome C ice cores, there is no measurable migration over 800,000 years.